Can you identify these and give me some idea of collectability? I have two of these - 40 cm high. 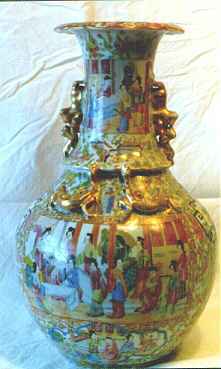 After it being fired could have been sent "in the white" to Canton (Guandong) to be decorated by the porcelain painters there. By this reason this decoration is called just "Canton" in Europe. In North America where this decoration is more common than in Europe, more attention is given to it and the style is subdivided in several groups with individual names. Your vase would have been called "Rose Mandarin" in USA. If the decoration had been mostly flowers the name had been "Rose Medallion". The key feature fort the date of your vase is the Greek style "Key fret" border around the medallion on the vase's lower part. From the picture it also looks like there is a glossy black enamel used around another medallion. This is in that case also a "late" feature that suggest that it belongs to the first decades of the 20th century. Regarding the value of your vase that "depends". If I were to indicate an "insurance value" I would suggest around US 250-500 $ each. The fact that you have a pair normally adds some 50% to the value.